The magnificent Petra and The Blue Mosque of Amman, The Arabian Desert and Wadi Rum, the stomping grounds of Lawrence of Arabia himself, T.E. Lawrence. The mysterious Dead Sea and Red Sea Coast. These are just some of the images that spring to mind when envisioning the Kingdom of Jordan. In fact, Jordan has something for every type of traveller. From high adventures like taking a hot air balloon over Wadi Rum or sleeping in the Desert having a Real Bedouin Experience to visiting the Kings auto museum. Maybe you can try Smoking Sheesha for the First time or witness the Roman Ruins of Jerash and of course you can’t miss visiting the ancient ruins of Petra. 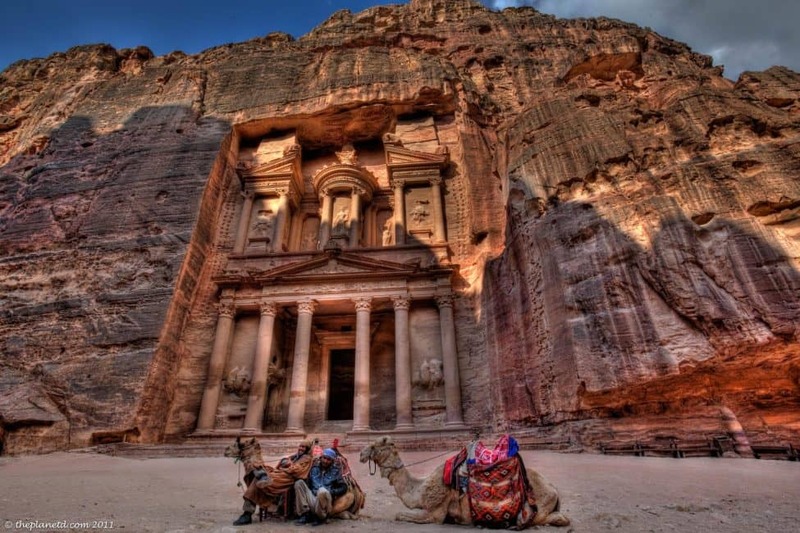 Visiting Jordan is an unforgettable experience and a definite addition to anyone's bucket list. This Jordan travel guide will help you plan your next vacation. Stonefish have a habit of lying half-submerged in the sand, so wear something on your feet if you're walking into the sea. If stung by a stonefish, see a doctor immediately. Aqaba has an excellent hospital where cuts, bites and stings can be treated. Most importantly, it has decompression chambers for the ‘bends'. June and July may be months to avoid. Ramadan will mean that many shops and restaurants are closed; Eid will mean that hotels will be fully booked. Most of the ecotourism projects operating in Jordan's Dana, Wadi Mujib and Ajlun nature reserves only operate between April and October. It is recommended that given the current political situation, travellers stay away from the Syrian and Iraqi borders. Jordan may be a small country but it has a range of different climates; on the same January day you could be throwing snowballs in Ajloun or topping up your tan on the Red Sea beaches. The best time to visit climate-wise is in spring (March to May) and autumn (September to November), when the daytime temperatures aren't too extreme. Summer lasts from roughly June to September and temperatures in certain areas have been known to top 45°C while wintertime in some cities, like Amman, can experience chilly biting winds, showers and even snowfall. In short, the Jordan Valley and Gulf of Aqaba suffer the worst summer heat and humidity while the winters in the higher central and northern areas can be quite cold. Dress conservatively. Jordan is a Muslim country, as a result women should be dressed conservatively (long pants, shirts with arms and shoulders covered) while men are recommended to keep their shoulders and legs covered. Many religious sites forbid shorts and sleeveless shirts for both sexes, so a light scarf is handy to wrap around the shoulders. Swimsuits are ok to wear at the beach or pool, but make sure to cover up before walking anywhere else. Pack loose clothing with breathable fabric – cover up with fabric you know will breathe. Tunics are a great option as they can be dressed up or down, are light weight and offer good coverage. Linen layers are also a good option. The protection basics – even if its cold and windy, doesn't mean that you won't get a sunburned, especially in places like Petra and/or Wadi Rum. Make sure to bring along sunscreen (SPF 30+), sunglasses and a hat. Layer up – Bring a sweater or jacket for cold nights in the desert, and maybe even a scarf and gloves. This is particularly true for Petra as it can go from hot to cold in minutes depending on how much sun the area gets. Footwear – Pack a pair of lightweight, durable and comfortable shoes that you don't mind getting dirty! If you plan on heading over to Petra and Wadi Rum, make sure to pack a good pair of hiking boots. Explore the Lost City – Whether its during the day or the night, Petra wasn’t voted one of the New 7 Wonders of the world for nothing! It is definitely one of those places that really lives up to the hype. Have a Lawrence of Arabia Moment in Wadi Rum – ride camels into the sunset in the Arabian Desert. Go Canyoning – hike, swim, slide and abseil right down the centre of the Wadi Mujib gorge, which houses some of the most spectacular cliffs we've ever seen. Float in the Dead Sea – The Dead Sea has a salt level of a whopping 33%. To give you an idea of the saline levels, the ocean has a salt concentration of only 3.8%. And that my friends is exactly why we humans have such an easy time floating in the Dead Sea. Sleep in a Bedouin Camp – go back in time and camp under the stars: Captain's Desert Camp is designed to replicate an authentic Bedouin camp. See the Jewel of Petra – To us, the Monastery is the most impressive building of the entire complex. Reaching 50 metres into the air, it is also the largest in all of Petra. Stay in Feynan Eco Lodge – Located in the Dana River Biosphere Reserve, it is a solar powered retreat offering peace and quiet while promoting conservation. Walk the street of Amman – Fact: Amman is one of the oldest continuously inhabited cities in the world. See the Jerash Amphitheatre – Jerash is considered the most well preserved Roman Ruins outside of Italy. Explore the Dana Nature Reserve – Do you like a good eco-adventure? Believe it or not there is a lot more to Jordan than Petra.